This course explores the deeper aspects of Chinese martial arts and Qigong: the secrets of the ancient masters! You all have the strength within you! True strength derives from the fascia, rather than the muscle. It needs strong intention and clear focus to lead it out. The body works best when used as a whole, not as an isolated part. So, you will train to move your strength and energy up from the soles of your feet like a wave rising through your whole body. James is a diligent student of Kung Fu and an easy going teacher. He connects well with his students which really helps their learning. James had been in the same line of work for 15 years and eventually wanted a different way of life. 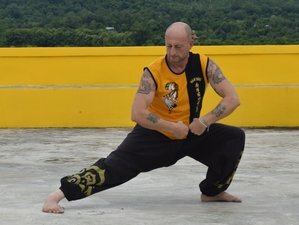 He began travelling and found his way to our Kung Fu Retreat. He loves how at Nam Yang we challenge ourselves mentally as well as physically. This enables him to learn more about himself every day which is reflected in his teaching. He is a good example to our students and leads from this ethos of self-development.